HomeNews Climate Change Is Certain to Change Our Lives. Here's How Stevens Is Helping Prepare. Climate Change Is Certain to Change Our Lives. Here's How Stevens Is Helping Prepare. Climate change is happening. That's settled. If the recent U.S. cold snap, wildfires or soaking hurricanes and tropical storms didn't convince you, the science should. Scientists worldwide have confirmed the planet is warming, largely due to to the atmospheric effects of human manufacturing, transportation and farming activities. Arctic summers haven't been this warm in more than 100,000 years; both polar ice caps are melting much faster than previously believed. Once-dependable fisheries are shrinking. That all seems abstract — but local communities have recently begun to understand how the global effects of climate change hit home locally, too. The warming atmosphere and world oceans are already creating frequent and stronger hurricanes, tropical storms, tornadoes and wildfires, as well as rising sea levels that have begun flooding coastal towns and cities with alarming regularity. In 2018, there were 14 weather events that caused $1 billion or more in damage in the U.S. alone. Trillions of dollars' worth of coastal – and even inland – property are at risk. So are we: food crops and water supplies will also almost certainly be significantly affected by the changing climate. 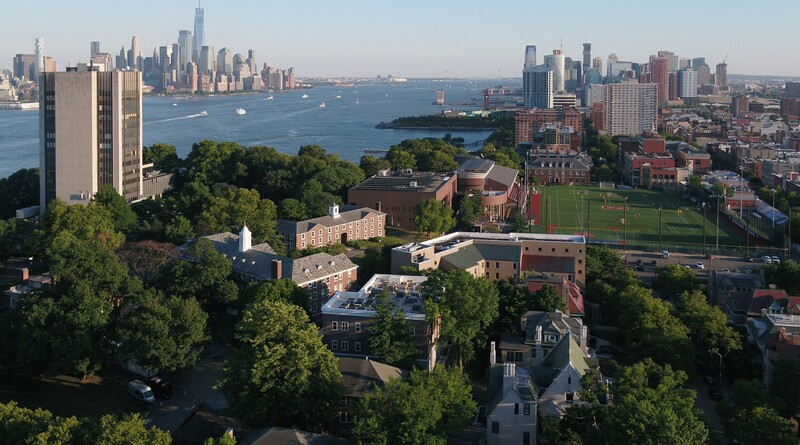 As a leading technology institution located on a major estuary in a major metropolitan area, Stevens has long performed research aimed at forecasting effects, preparing communities and engineering new technologies for living in an era of more extreme climate events. Stevens faculty, including Davidson Lab researcher Philip Orton, have long helped advise New York City mayors Michael Bloomberg and Bill de Blasio on the city's comprehensive climate-change reports and forecasts — the most recent of which anticipated sea level rises of as much as six feet in the metropolitan region over just the next 80 years. An updated report — incorporating Orton's research, including new charts, maps and modeling of regular, monthly tidal flooding that is being worsened by climate change in the metropolitan New York region — will be issued by de Blasio's office in March. Stevens faculty also contributed scientific review to the Fourth National Climate Assessment (NCA4) report, released in two parts in 2017 and 2018. That report raised significant alarms about droughts, wildfires, crop damage, flooding and other weather effects that have already begun reshaping the nation and the planet. Stevens researcher Reza Marsooli, who joined the university's faculty in fall 2018, is an expert in the modeling of river and coastal flooding, storm surge, and wave hazards during periods of changing climate. At Stevens, he will continue research conducted at the University of Mississippi, Princeton University, and during his time as a postdoctoral researcher at Stevens. Hurricanes, tropical storm-fueled rainy spells and large, crippling snowstorms are becoming stronger and more frequent as the global climate warms, and that trend will continue; emergency planners must deliver better public information than ever in the days and hours ahead of storms and floods. And Stevens' longtime leadership in forecasting extreme weather events has become increasingly critical for those planners as those extreme events continue to increase in number and strength. The university's expertise in forecasting storm surges garnered national media attention during 2013's Hurricane Sandy, when the university's NYHOPS and Stevens Flood Advisory System (SFAS) prediction tools correctly anticipated record-breaking flooding. Media called on Stevens experts again during 2017's Hurricane Harvey to explain why coastal plains flood so severely. Synthesizing data from dedicated water monitors and crunching numbers using a proprietary model on a dedicated supercomputer, Stevens continues to supply data to the Port Authority of New York and New Jersey; New York City (including street-by-street flood forecasts); New Jersey Transit; the National Weather Service; and other government entities. Local communities won't be left out, either. Orton is helping advise two flood-prone neighborhoods in New York City, Hamilton Beach and Canarsie, with forecasts and scientific modeling – useful information for neighborhood officials and planners who seek policy change and physical protection from the higher floods climate change will bring in the future. As its root, climate change traces back to planet-warming greenhouse-gas emissions. Stevens systems and transportation researcher Yeganeh Hayeri investigates automated vehicle technologies such as safety cameras, adaptive and cooperative adaptive cruise control and dynamic route guidance. Wider adoption of those technologies, her team recently found, could result in significant reductions in emissions of gases from vehicle tailpipes. In total, such technologies could save as much as 267 million metric tons of atmospheric carbon dioxide, carbon monoxide and nitrous oxide by improving driving routes, engine efficiency, crash avoidance and other factors. The technologies would also save consumers considerable fuel costs: as much as $6 billion, according to another study Hayeri performed in collaboration with Carnegie Mellon University. A host of projects across the university work to engineer solutions to the many pressing challenges posed by climate change. Stevens students, for example, designed the SURE HOUSE, a zero-energy solar home that was also designed and constructed to withstand hurricane-force wind and floods. The home now sits on permanent public display at Liberty Science Center in Jersey City, a reminder of the ways in which communities, architects and officials will need to factor climate change and extreme weather into future planning decisions. And Orton is supported by the National Oceanic & Atmospheric Administration (NOAA) in continuing research on the potential benefits and long-term effects of proposed gated storm barriers in locations around New York Harbor. * Better energy efficiency. Consumption, combustion and energy use go hand-in-hand with emissions and global warming. Stevens teams are currently investigating means of enhancing energy efficiency and storage, including projects on improved battery and solar cell designs; new types of biomass conversion reactors; and promising efforts to cultivate and harvest microalgae oil for fuel. * Sharper eyes in the sky. Stevens' Light and Life Lab works to enhance environmental monitoring for scientists who watch from the skies for signs of planetary warming and change using instruments deployed on aircraft and satellites. Working with international partners including NASA, NOAA and Japan's JAXA space agency, professor Knut Stamnes, together with colleagues and students, create and test remote sensing methods that improve the quality of information derived from satellite imagery by compensating for ice and snow cover in polar regions and phytoplankton in ocean images. The result: clearer, sharper images of oceans, coastlines, coral reefs, glaciers, ice packs and other landform features, including quantitative information that can be used to assess climate change. * Improved ocean monitors. Ocean salinity is a key metric when measuring the pace and extent of climate change and ice melt, but high-quality, cost-effective sensing has been elusive. Now a team led by Stevens materials science researcher Fei Tian has recently developed a new, fiber-based sensor coated with specially engineered hydrogels that can serve as a reliable, portable sea monitor of salinity. The team also included professors Henry Du and Fan Yang, graduate student Di Wu, and collaborators at Texas A&M University. * Coastal protection and rebuilding. Stevens ocean engineering professor Jon K. Miller has long worked with federal, state and local agencies, engineering firms and NGOs on the monitoring of the coastline's response to the effects of climate change and extreme storms. He also helps design innovative approaches, such as beach nourishment and living shorelines, to mitigate the impacts of storms and climate change to enhance local communities' resilience.